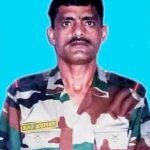 Subedar Raj Kumar was born on 9th March 1970 and hailed from Khaani village in the Nurpur area of Kangra district in Himachal Pradesh. Son of an army veteran Sub Dhian Chand and Smt Kalo Devi, Sub Raj Kumar joined the Indian Army In 1999, at the age of 20 years. He was recruited into to 24 Punjab of the Punjab Regiment, a regiment known for his valiant soldiers and numerous battle honours. By 2017, Sub Raj Kumar had put in about 18 years of service and had served in various operational areas. He got promoted and became a Junior Commissioned Officer and proved his mettle as a dedicated soldier. 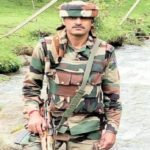 Later, as a Subedar, he was deputed to serve with 53 Rashtriya Rifles battalion, deployed in J&K for counter-insurgency operations. Subedar Raj Kumar got married to Toshi Devi and the couple had two sons, Rohit and Mohit. During the year 2017, Sub Raj Kumar’s unit of 53 RR was deployed to Drang area of Beerwah in Budgam district of Jammu and Kashmir. The units area of operation was infested with terrorists and soldiers were required to maintain a state of high alert all the time. The unit launched armed patrols at regular intervals to maintain the vigil. On 9th October, Sub Raj Kumar was leading one such patrol. When the patrol was returning back to the base a group of terrorists in pre-planned move attacked the patrol party. Though the attack was sudden Sub Raj Kumar along with his troops swung into action and retaliated with full force. 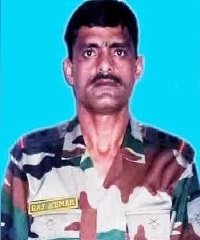 However, during the heavy exchange of fire Sub Raj Kumar got hit by bullets and was severely injured. He later succumbed to his injuries and was martyred. 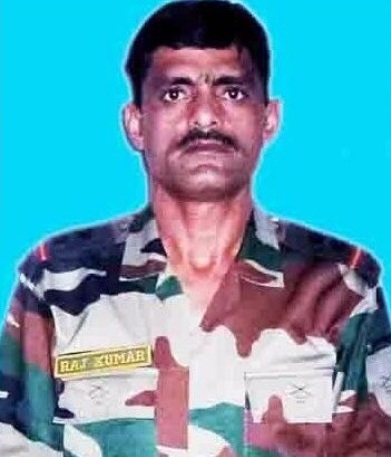 Sub Raj Kumar was a valiant soldier, who made supreme sacrifice for the nation. Sub Raj Kumar is survived by his father Sub Dhian Chand (Retd), mother Smt Kalo Devi, wife Toshi Devi and his sons Rohit and Mohit.